Want to put together the perfect 72 hour emergency kit but don’t know where to start? Or do you already have a kit but don’t know what’s in it for sure or how to use any of it? Creek Stewart from Willow Haven Outdoor has a new book out called Build the Perfect Bug Out Bag: Your 72-Hour Disaster Survival Kit that can help you get your perfect emergency bug out bag packed. 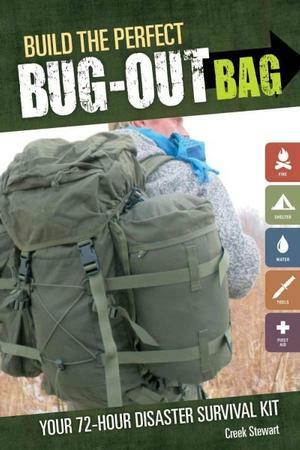 In his book, Mr. Stewart has created a definitive reference for building your bug out bag. After a brief discussion on the “why” of having a bug out bag packed, he delves right into the “how”, walking the reader through each element that should be included in an emergency pack. Water, food, fire, clothing, knives and other tools, self defense, and more are all covered in depth, giving various examples for each element along with explanations and reasoning that cut tons of trial and error time for the reader. There are comprehensive checklists for different needs, exercises to help you familiarize yourself with your bug out bag and plan, and helpful quick tips throughout the book. And pictures. Lots of pictures. This book would have been a lot longer if Mr. Stewart had to explain different shelters that can be built with a rain poncho or how a frameless pack looks in comparison to an external or internal frame pack or any of the other items or concepts that the pictures illustrate so well. I particularly appreciated that although Mr. Stewart is obviously a young, fit, outdoorsman, he included in his book those who are not–infants and children, elderly, and even pets. Even if you’re just not-so-young and/or not-so-fit, you can use this book to create an emergency kit that works for you. I also love that with all the analysis and recommendations of available products, Creek ultimately encourages the readers to make their own decision on what equipment will be going in their personal and family bug out bags. The perfect kit for me isn’t the perfect kit for you. My perfect kit probably won’t even be perfect for me five years from now. Mr. Stewart understands that and has written his book to give you the knowledge to make your own kit perfect for you. If you’re looking to get your emergency packs assembled or even if you have them built and want a re-analysis of what you have packed, Creek Stewart’s book is definitely worth reading. I have a giveaway going for two signed copies of Build the Perfect Bug Out Bag: Your 72-Hour Disaster Survival Kit. Check this post to see how you can win one of them. 1. How old were you when you built your first Bug Out Bag? I got my first 72 hour kit when I was about 15. My mom put them together for each of us and I took mine with me when I left home. That kit has evolved into the kit I have today, although I doubt there are any of the original components still in the kit–they’ve all been swapped out and updated with different equipment as my needs and knowledge as well as available equipment has changed. I’ll be doing more kit morphing since reading this book. The first kit I built from scratch was for my husband shortly after we were married, but he’s altered that one so much it barely resembles the one I put together anymore. I also put kits together for all my kids when they were very small–baby brother had one built for him before he was even born. 2. What do you consider the top 5 items in your Bug Out Bag? Telling you the five items on top of my bag is easier than choosing the top five items in my bag. But if I have to choose only five I’ll go with these: Water and the means to purify more water, food, first aid supplies, fire starting equipment, and extra glasses. I’d hate to be wandering around trying to build my fire half blind. What about you? Feel free to share your answers in the comments section. Build the Perfect Bug Out Bag by Creek Stewart is available on amazon. Also be sure to check out Creek’s blog Willow Haven Outdoor for more great survival instruction. Very nice and rounded review. When it comes to knives, I think one needs a small every day task one and a good “survival one.” The pocket tool is still important and has its place in the kit just like a swiss army knife would. 72-hour kits are always great to have. I remember my first one! I was maybe 11 years old and my family was all making ours together. The next day I sneaked into mine and ate the granola bars. Thankfully they’ve been replaced though! I keep mine in my car because I’m always on the go (between work and summer school). At least I know that if I am stranded anywhere, I’ll have something to eat and a way to bandage up any wounds! Check out the SOL emergency sleeping sacks. They are around the same size as a can of soup if not smaller and take up very little room in your pack.